I dedicated my first novel Clairvoyant, the Imagined Life of Lucia Joyce (the story of James Joyce’s daughter Lucia Joyce, who spent 47 years in mental hospitals), to an Irish nurse friend. 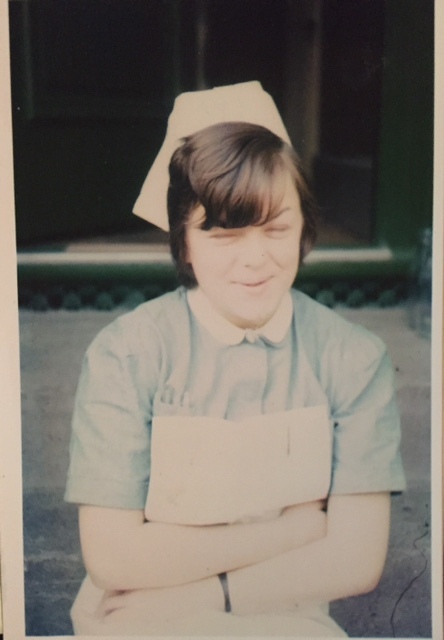 At the end of my Author’s Afterword I wrote: … This book is dedicated to all kind, caring nurses around the world especially Nurse A.G. Kennedy…whose loving care altered this author’s life. An understatement, actually, since I credit Nurse Kennedy – Anna – with saving my life at a long-ago vortex. (Details at some point down the road. Perhaps.) Maybe this is when my soft spot for nurses, and also for the Irish, began. Anna (we met at the beginning of the 70s), always insisted she would retire in Ireland. But, when the time came, almost no one she knew was still alive there and the plan faded away. She lived in a rent-controled apartment on Bleecker Street. 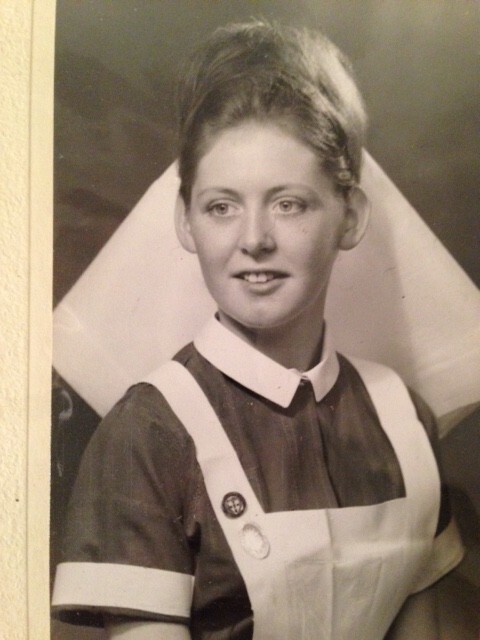 Around the time she retired from nursing, I was again based in New York. Another nurse friend, Andrea (also Irish, originally from Belfast), Anna and I, began having dinner together every couple of months, like clockwork. Because Andrea still worked (on a geriatric psych ward at a local hospital) and her shift ended 4ish, our meals were scheduled on the early end. At first we met at restaurants but soon began to meet in my apartment. I would cook or order in; Andrea would bring wine, other drinks; Anna always brought pastries from Pasticceria Bruno on LaGuardia Place. There was nothing I prepared through the years that Andrea and Anna didn’t eat with relish. (You’d have throught I was a great cook, which I’m not, they’re just appreciative and good eaters.) They’d usually leave by 6:30. In the last 4 or 5 years Anna started speaking gibberish. She was losing weight, was often unkempt. Long story short, she was diagnosed with advanced Alzheimer’s. Our get-togethers continued. Anna somehow was able to make it to Chelsea from the Village every time while Andrea and I held our breath waiting for the inevitable shoe to drop. In November, on the afternoon/evening of our last gathering, Anna didn’t show up. We waited and waited, then ate. Just us two. After the next shoe dropped, Anna’s guardian took her to live in a ‘home’ on Staten Island while the guardian, Andrea and others in the inner circle began dismantling her apartment. Yesterday, a foggy, too warm day two days before Christmas, Andrea and I met at the Ferry terminal and traveled to Staten Island jumpy with trepidation. No sad story follows, since we discovered that Anna’s good nature, like cream, had risen to the surface. She was clean, safe, knew everyone, everyone knew and already loved her. Her anxiety had diminished. Her room looked out at the ocean. She managed to explain that she relished the sunrise every day. Able to make sense of her gibberish, we had a good time, some laughs, had lunch in the dining room with others who lived there. Anna still remembers the old times and, so far, so do Andrea and I so there’s much between us. Before departing, we agreed to continue our periodic get-togethers on Staten Island. Anna indicated that she could no longer provide desert. We reminded her that now she was hosting, one or the other of us would take on her old job. Besides, Bruno’s no longer existed, had shut after 41 years, so what difference did it make. Anything sweet would do. We left in time for Anna to play bingo with her new friend Sylvester. Outside, the sky had opened wide, pouring rain in buckets. The windows of the bus that took forever getting to St. George’s Harbor fogged up and the Verrazano-Narrows Bridge that had loomed so large on the way in had disappeared into the fog on the way out. When the gates opened to allow us onto the ferry, we sprawled on a bench on the Statue of Liberty side, hot coffee in hand. Andrea remarked that while clearing out Anna’s apartment, she’d discovered the pastries unfailing Anna had meant to bring with her on the evening of what would have been our final gathering. Unfortunately, as she wasn’t able to find her way uptown, she must have returned home and put the white cake box tied with string into her freezer. The cannoli’s were frozen solid when Andrea found them. We began to speak of other things. The inevitable subject of movies came up. I suggested the film “Brooklyn” based on Colm Toibin’s novel, that I, a lover of everything Irish, had just seen and been melted by. It’s a must for you to see, I urged. Ed and I saw it. I hated it, Andrea responded to my surprise. Realizing that it was her story too, having emigrated to New York from Ireland as a young woman just as the girl in the movie had, I asked, How so? I guess you had a different experience. I ask her to tell me about it, realizing (shamefully), that I – usually so nosey – had never before snooped into her history. When I finished school in Belfast, I was accepted as an exchange student by the Michigan Council of Churches in Bay City, Michigan. I was 18, fairly naive, had attended an all girls school. My family was Protestant but not religious. My father was dead and my mother wanted me to see afield before starting nursing school. Mother drove me to Cobh, Southern Ireland and I happily sailed in 1960 to Quebec, then took a train to Michigan. I was met by my ‘American’ parents who would be my family for a year. I was suddenly homesick, I couldn’t stop weeping. My ‘family’ got and stayed upset because I was so horribly homesick. The first Sunday they brought me to church, they were very Christian. I was marched up to the front of church and told to introduce myself. I was mortified, all I could do was stutter some words. The only real thing that happened in the movie “Brooklyn”…that also happened to me…was that later, after I’d finished nursing school, and come back to America, to New York, where I was able to work in a good hospital, I, like Eilis in the film, had to go back to Ireland. Eilis was summoned when her sister dies, me when my mother got sick. Like her, once there, my mother’s women friends told me it was my duty to stay and care for my mother. Their view was that I should give up my New York life since I had no husband, no children. My mother and brothers never told me I should stay but the Greek chorus did. My mother had had both legs amputated because of bad circulation. I stayed and lived at the hospital with her. At night I’d lay my head at the end of her bed where, because she has no legs, there was a space for it. She finally died, setting me free. I closed her eyes. Before I left the hospital staff asked if I wanted her two amputated legs. I want to kill them. I said No. 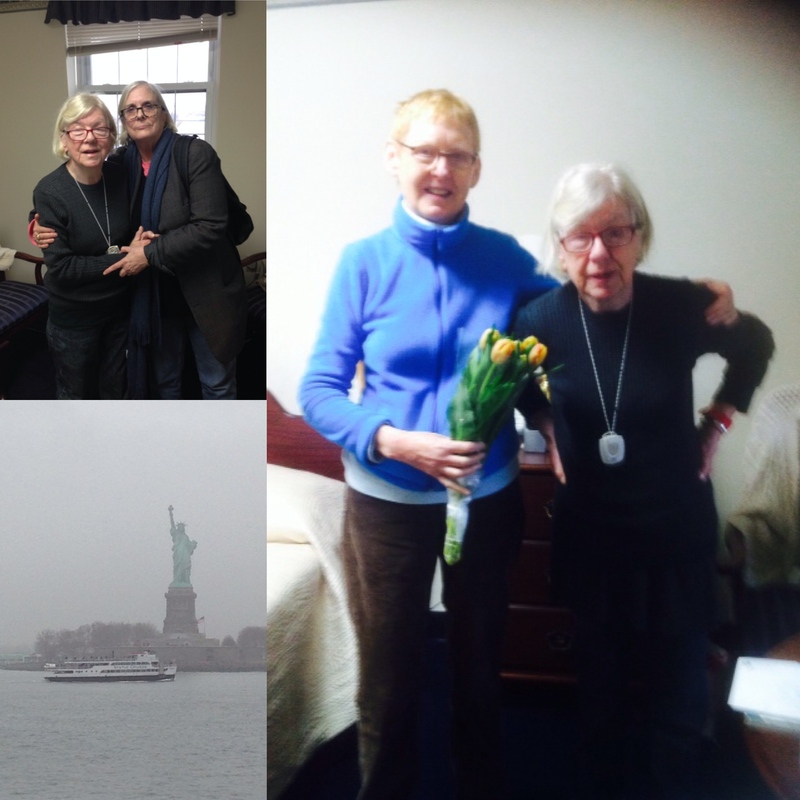 I emptied her small apartment, then my brother took over, and I returned to New York. Three months later a friend took me to Montauk for a weekend. While there I went into the sea alone. I thought I should keep walking away from the shore, I should drown. It was misty, seductive. I thought of my brother and came ashore. That’s a little less romantic than “Brooklyn” wouldn’t you say? Our ferry was docking. We agreed to arrange our next journey to S.I. in the New Year. I’ll bring the wine and drinks. We quickly walked toward the #1 train, wanting to get home before the worst of the pre-Christmas Eve rush began. I felt a little naive, also foolish to have been so drawn into “Brooklyn” – both the book and the film. I remembered something Virginia Woolfe had said about fiction: “Fiction is like a spider’s web, attached ever so lightly perhaps but still attached to life at all four corners.” And what about fact? Apropos of Andrea’s youthful experience, fact seemed like an Asp nest, also attached to life at all four corners. You’ve been a great friend. Both to Anna and to me. See you soon. America is a great country. A simple way to take measure is to look at how many want in and how many want out. It’s good to hear that Anna has settled in. My mother spoke fondly of her. My favorite books about Irish immigrants to New York are A Tree Grows in Brooklyn (by Betty Smith) and Angela’s Ashes (by Frank McCourt). The former is a classic tale of overcoming adversity and making good in America. In the latter, a memoir, the Irish family returns to Ireland after just a few years, no better off. I love, love, love A Tree Grows in Brooklyn. Have re-read it many times. Always makes me cry. Also: The stage adaptation was the first play I saw in my life when I was a child, with Shirley Booth, an unforgettable actress….1951…. A lovely reflection, Alison. By the way, I quite enjoyed Brooklyn, though I found the film more pleasurable than the novel (I’m not a huge fan of Colm Toibin). Some immigrants had a better experience than others. I actually liked the film better than the book… Because of the period flavor, I think. Loved your Anna, Andrea, Alison story. As for A Tree Grows in Brooklyn, I was in the 1949 summer stock tryout of Come Back. Little Sheba with Shirley Booth (and Sidney Blackmer.). She was absolutely sweet and wonderful, professionally and personally to me. My part was cut (and should have been) when it went to Broadway and I went back to college. I played the unnecessary policeman, looking incredibly Irish in the uniform. I had a hard time believing it. Everybody else thought it was great fun. Speaking of Irish, please see “Spotlight.” It had me on the edge of my seat all the way through. It’s the true story of the Boston Globe’s expose of the Church’s protection of all the priest child abusers in The Boston Diocese. Because I frequently visited grandparents living up that way and because I was razed a Catholic, it probably meant a little extra to me, but it is nominated for Best Picture. Oh Alison, what a fascinating life journey story. I enjoyed every morsel of your telling it! Really put BROOKLYN into a different perspective. It’s all very moving none the less. Oh Nina. I got the perspective challenged too. Thanks for your comment.